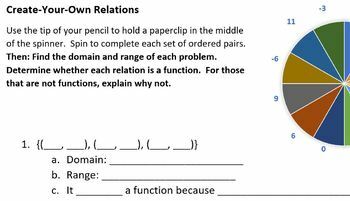 To give students some practice finding domain & range from ordered pairs, give them pencils, paperclips, and this worksheet. They use the spinner on the assignment to choose numbers. Once they've filled in each x-coordinate and y-coordinate in the lists of ordered pairs, they write the domain and range, tell whether they have created a function and explain their answer.